Joe and Teresa Lang of Lang's Martial Arts stand in their new studio in Brookfield, Conn., on Wednesday, July 11, 2018. While it was competing that kept Joe Lang focused on Taekwondo for many years, the Brookfield resident is settling in to the role of teacher. 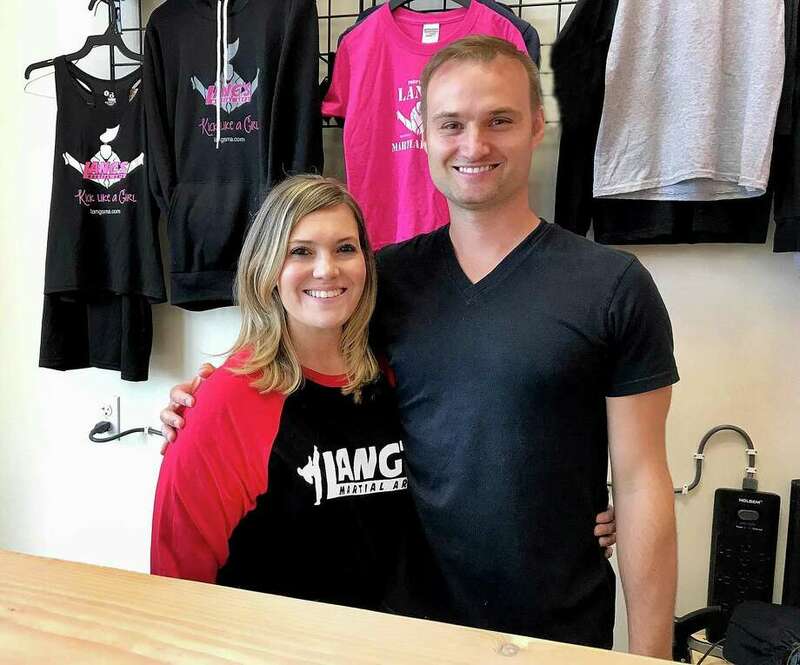 Lang, along with his wife Teresa, opened Lang’s Martial Arts in the new plaza at 540 Federal Road in Brookfield. They formed the business more than two years ago and had previously taught out of a gym in New Milford. Lang started taking martial arts lessons from Deborah Snopkowski when he was 4 years old. He continued training with Mike Zandri, who bought Snopkowski’s school in 1999. When Zandri moved his studio to Maine, Lang saw an opportunity to open his own Taekwondo school without competing with his former instructors. Lang is an accomplished martial arts competitor and took part in world championship events in Canada, Italy and Greece. He does not compete often anymore, but is considering going to the world championships in Brazil this year. As a teacher, he stresses flexibility and balance. He said in his prime he could touch a basketball rim with his feet. Teresa Lang said her husband is adept at teaching students of all ages and abilities. The Little Dragons program starts at age 5. Lang said he wants to add classes such as self-defense, black-belt training and specialty techniques. Lang’s Martial Arts was the first business to open in the plaza at 540 Federal Road, which now also includes The First Bite Catering and vitamin shop FoundationRx. Joe is not related to the owner of Lang’s Auto, which is across the street from the plaza. Lang’s Martial Arts may be reached at 203-312-4140.